JURA presents the most intelligent coffee spout of all time. Simply turn the spout to the position for 'one' or 'two' cups, gently activate the touch panel and the innovative ENA Micro 5 will perfectly prepare one or two specialty coffees. 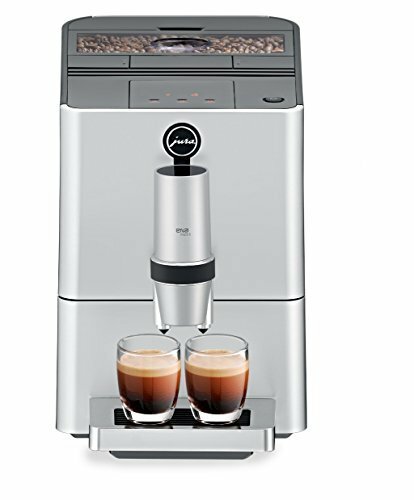 For the first time ever, the ultra-compact automatic coffee machine allows the strength to be preselected for two cups, paving the way for a wide range of delicious varieties - from simple espressi to trendy double shots. Intelligent coffee spout - There has never been an automatic machine better designed to prepare either one or two cups. When you turn the height-adjustable coffee spout, it recognizes whether you have selected one or two cups and prepares the corresponding volume. The coffee flows through one or two spouts into the cup or cups, guaranteeing a wonderfully subtle crema. Simple operation Gently activate the touch panel with three freely programmable cup sizes, each with two preselectable strength levels, for the specialty of your choice.